Introduction: This article focuses on introducing a new solution which will allow safe and smart turn ON/OFF of the Smart phones. It also offers an integrated solution which will allow the Smart time driven RESET of the device integrated in same device. The implementation allows of cost and space saving for manufacturer as well as better aesthetics of the phone and better user experience. The solution will allow the user to avoid the annoyance which comes from system freeze because of no responding operating system. Advent of Touch screen phones has opened a whole new era incredible user interface. Now even Media players, game consoles and e-book readers are also based on touch screens. The manual buttons have now become undesirable in these devices. So it becomes important to harness the maximum functionality from existing buttons to reduce their number. Besides, most modern phones and similar handheld devices runs on operating system which are prone to getting hang if any unforeseen situation arrives while operating. Today Companies put lots of efforts on developing the products features such as adding widgets for social network, android/windows based interfaces and java applications etc. But adding these software based applications also make devices prone to getting frozen. It is frightening to imagine these gadgets getting frozen or valuable data getting lost. Life without mobile phones will even come to a halt. After coming such a long path in the way of progress, we can’t allow ourselves to come to a standstill. Traditionally there are two ways to over come a system freeze – One way is to remove the battery but this way can cause critical data loss and may even potentially damage the system. Some phone maker do not even allow removing the battery. The other traditional way is provide provision of system RESET via separate button on the device itself. Most manual reset keys, where provided, are hidden to prevent resetting the device accidentally. This is done by adding a RESET Hole in the system. This work around is not only the compromise on the aesthetics of the gadget, it also adds to the cost by introduction of extra switch and PCB space. 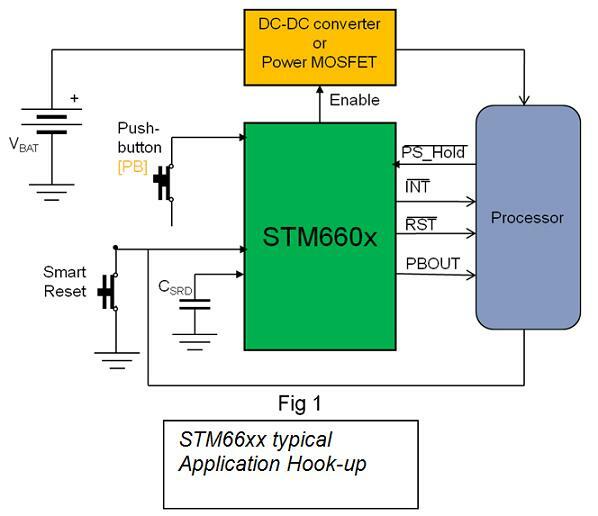 STMicroelectronics solution allows turning ON/OFF of device as well as solving the system freeze problem without adding an extra button on the device. This would not only lower down cost of putting the reset key in the equipment but also avoid the risk of data loss by removing the battery. Application hook-up of this IC in the mobile phone is explained in fig 1. The Push-button[PB] is a Power ON/OFF button and Smart Reset is the button which normally does the normal function such as Audio or camera but it can also be used to Reset the system along with PB button. SMART Push Button ON/Off Controller is a new family of House Keeping controllers, which aims to help designers to get rid of some commonly seen “push buttons & power path management” challenges. It can also help the designer to simplify designs, reduces parts count and saves on overall system cost while improving the device Design. 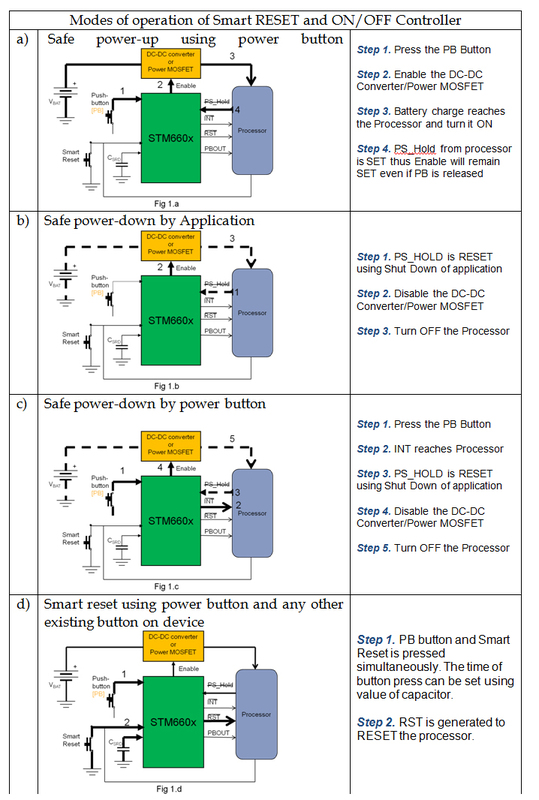 Various modes of operation Smart RESET and ON/OFF controller are explained pictorially in Table 1. The arrival of this chip will enhance users’ experiences by providing a safe, convenient and easily understood means of restarting those frozen gadgets. For manufacturers, combining an improved manual reset with the system-controlled reset functions in a single chip offers better performance and saves cost and pc-board space. Its 2 x 3 mm package has a smaller overall footprint than using separate chips for system reset and one-key manual reset, or an equivalent network of discrete components that can occupy as much as 100 sq-mm on the board. In addition, as manual reset is controlled by normal user button, the STM66xx can enable product designers to eliminate the need of hidden reset button which user have to access hole in the casing. This can create a cost effective, easily accessible, smart looking and waterproof new products. An e-video on STM660x can also be viewed at http://www.st.com/internet/analog/class/1687.jsp.